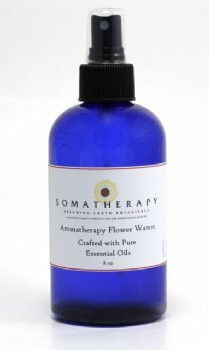 Geranium Flower Water - Egypt - Distilled water infused with Geranium essential oil. Flower Waters are very mild, have a gentle fragrance, and are quite refreshing when sprayed on the face and body. Geranium is known for its grounding properties, and Geranium flower water is especially nice to use when when feeling stressed, tired or generally out of balance. The four and eight ounce sizes come in a Cobalt blue bottle with atomizer top. Larger sizes are refill, and do not include a spray top.